Almost overnight Oklahoma has grown into a state with a formidable arts and culture scene. What was once a state known only for its rich Native American and Western heritage, has undergone a transformation. The arts have become very important to Oklahoma’s economic growth and creative professionals are contributing more and more to the landscape. One of the strongest surges of creativity is coming from artists of color. These individuals are beginning to change the composition of the state’s once predominately white arts community. More African and Latino American artists are finding a voice amidst the growing number of galleries and art venues in the state. 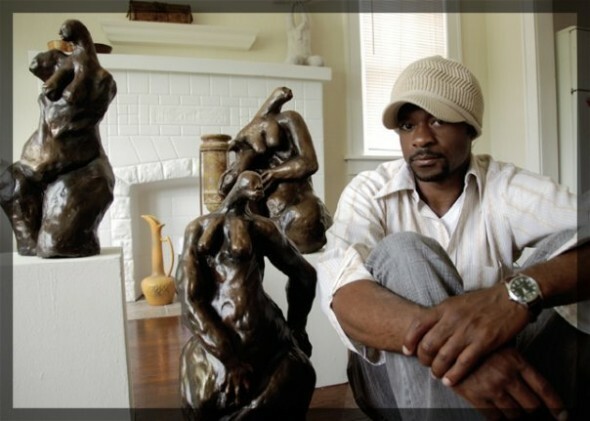 Nathan Lee is a painter and sculptor in addition to being Executive Director of Inclusion in Art. One new venue is providing a platform for filmmakers of color. The In COLOR film festival is dedicated to showing works by minority filmmakers and films with a strong multicultural component. The festival is meant to not only show the vision of under-served filmmakers, but to introduce them to the rest of Oklahoma’s mainstream arts community. Like many artists of color in Oklahoma, minority filmmakers have traditionally experienced difficulty finding venues to show their films. At the same time organizations with an interest in those very filmmakers have had limited success in attracting them to apply for festivals. In COLOR is a bridge for minority filmmakers and organizations looking for greater cultural diversity to come together. In COLOR was created through a partnership between Inclusion in Art and IAO Gallery in 2008. The first two years In COLOR featured a single feature film and several shorts. The events were so well received, the decision was made to introduce In COLOR as a full film festival. Now in its third year, In COLOR has expanded its selection of feature length films and shorts. The event is being held in two venues in historic Film Row in downtown Oklahoma City. The Paramount Theater has joined Inclusion in Art and IAO Gallery in an effort to grow the festival. Now In COLOR features a matinee portion for casual film buffs looking for a specific film and an evening fundraiser which includes food, music, and access to all of the films. While In COLOR has a definite mission when it comes to working filmmakers of color, the festival also helps fund Inclusion in Art’s Teen REACH Program. Teen REACH (Resources Encompassing Art Creativity & Hope) was created as the youth outreach component of Inclusion in Art. The program is different than many of its contemporaries because teens are exposed to the different aspects of one specific medium. In its pilot 2012-2013 year, Teen REACH focused on film. Students learned about directing, writing screenplays, story boarding, editing and much more. In addition to learning the craft of film, students worked with their art mentors on life skill exercises and esteem building. The program is very focused on team building and each student’s role no matter how small their contribution, is given positive reinforcement for contributing to a better whole. Nearly all of the teens in Teen REACH are from the DHS system, have been identified by their school as at risk, or are on probation. Currently Teen REACH has been successfully implemented in two community centers and is poised to expand to schools and other locations. In future presentations of In COLOR, the film projects of the Teen REACH students will be included in programming to expose others to the creativity of these talented youths. Tagged community, DHS, festival, film, Film Row, IAO, Inclusion in Art, Individual Artists of Oklahoma, music, Nathan Lee, Oklahoma City, The Paramount, writing, youth. Bookmark the permalink.